And...before the Halloween card I made this fun little card. You can't see the remnants of that one so much because they are buried by all that other stuff, but you know how it goes! HA! 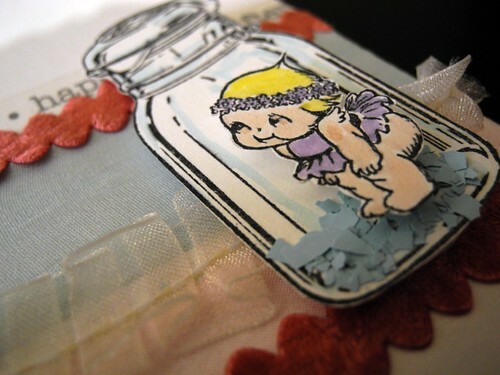 The jar stamp and the ADORABLE STINKING Kewpie doll are from 100 Proof Press! The trims are all from May Arts. I colored the stamps with markers (Tombow) and then added some Stampendous! colored fragments at the bottom of the jar. Those are brand new and SO COOL!!!! The images are the Large Unmarked Mason Jar and the Girl Cupie. I love both of these images SO MUCH!!!! I hope you have a super fabulous Wednesday! You might want to stop by this weekend, as Sunday is my birthday and well....I like to share on my birthday!!!! Just say'n. P.S. Check out all the fabulous WOYWW posts over at The Stamping Ground! so many goodies on your desk!!! Looks like the desk of a truly creative lady! Your card is adorable! Love the kewpie in the jar! Great cards and lovely messy working desk! Creative frenzies kind of all look alike, don't they? :) visiting from woyww. Kewpies are my faves!!! And your kewpie peeking out of that jar is WAY too adorable! As for your workspace? It seriously looks GOOD compared to my entire craft room today. I have everything turned upside down, trying to rearrange it in a more accessible & functional manner. Yeah - right! I'll SO be back on your birthday but NOT because you may be in a giving mood! I'll return because I will be jumping right on that HAPPY BIRTHDY TO YOU bandwagon! Have a happy day, lil' Jen! HUGS!! Look at that cute little card! Well, I see space on your balck mat, so there's been space to =work in, so it's all good. Hallowe'en - good grief..but I must say that I probably do my best Christmas stuff when it's too late/early! 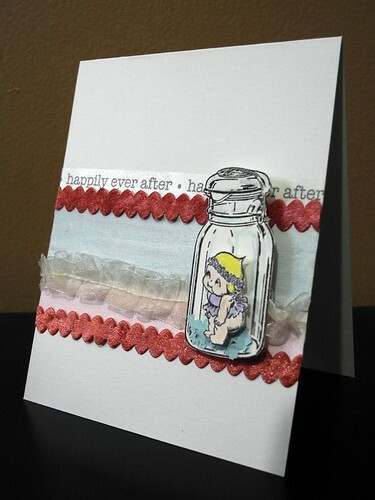 Cute cute happy card..I can live without the Kewpie but I like the jar!! Cute card,Jingle..but Halloween...however do you muster up the mojo for it at this time of year? great halloween papers on your desk and your card is so cute! Your card is adorable. And I JUST did a Halloween page on Sunday, so I've probably got some remnants on my desk, too. Awh, this is a sweet card:) And nice tease...looking forward to seeing your bday surpirse! now THAT is what I call a crafty desk!!! Eeek! Halloween? I,m just getting my head round Christmas! love your mess. Thanks for your guess but Nah! It,s wrong totally missing it. Clue ... something to do with a needle and thread..... ???? Wow what a lovely craft space and a stunning project! Hi, Jingle! Your card is adorable! Love seeing your desk. 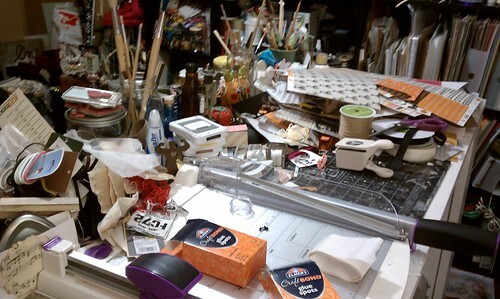 A messy desk is a sign of a creative mind! I have never seen that stamp image before - too cute! Great card - love that ribbon! Love your cute little card as always. your desk loos like mine! Wow cute card hun love the image of the bottle!Happy Birthday for sunday ,hope it's agood one! Lots of creative love on that table! Halloween - hee hee. Cute card!! Sweet card! What a cutie! Love yr desk! But sdote that cutie on the sweet card!